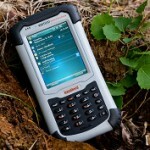 The Nautiz X7 ® exemplifies the evolution of handheld computers. Packed with innovative advancements in PDA technology, it surpasses everything else on the market with its mix of power, functionality and ruggedness. The Nautiz X7 can do everything you need to do – and some things you may not have even known you could do. Performance begins with speed and power, and the Nautiz X7 offers a lively 806 MHz Xscale processor, with 128 MB of onboard RAM and a generous 4 GB of Flash storage. And this field-ready workhorse will go all day and more, with a 5600 mAh Li-ion battery that will operate up to 12 hours on a single charge. No other PDA provides more storage or longer standard battery life. The Nautiz X7 also delivers an unprecedented package of capability. It starts with integrated SiRF Star III GPS, Bluetooth 2.0 and 802.11b/g WLAN functionality, plus a built-in 3-megapixel camera with autofocus and an LED flash. And the Nautiz X7 goes above and beyond with innovations such as 3G capability for GSM/UMTS phone and data transmission, an integrated compass and altimeter, and even a g-sensor/accelerometer that can measure speed, vibration and rotation, opening the door to countless application possibilities. The Windows Mobile 6.1 operating system, 3.5-inch VGA touchscreen display and choice of numeric or PDA keypad make this handheld as easy to operate as it is groundbreaking. Of course, a tool with all these features would not do much good if it is not built tough enough to take virtually anywhere. With an IP67 rating which is unsurpassed among handheld computers, the rugged Nautiz X7 is impervious to both dust and water, and it can withstand repeated drops, vibration and operating temperatures from -30 °C to 60 °C. It weighs in at just 490 grams, and it’s compact enough to operate in one hand. 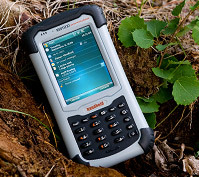 With a combination of features and rugged performance you can not find in any other handheld, the Nautiz X7 is leading the way in mobile computing.